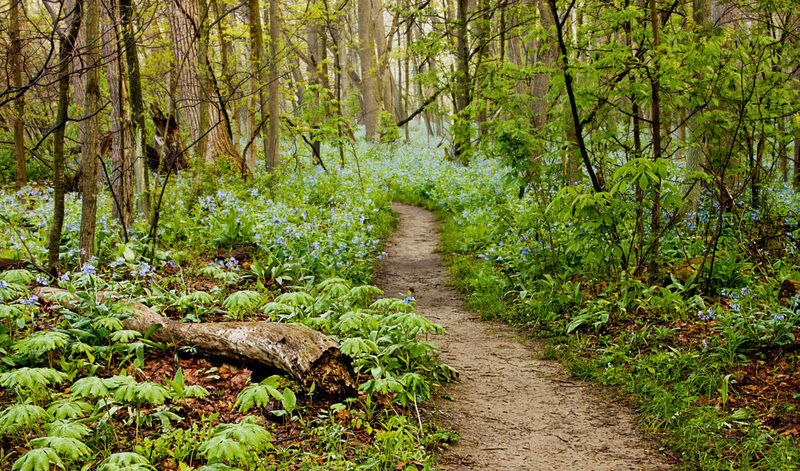 If you’re looking for a fun, short hike to do with the whole family, Furnace Run Trail is just the loop for you. It covers just over 2 miles and besides a steep start, is a nice rolling, moderate hike. The trailhead for Furnace Run begins across the street from the Everett Bridge parking area. Furnace Run Trail is not to be confused with Furnace Run Metro Park. Starting the hike you will be met with more than 90 zigzagging stairs that will raise your pulse and provide a good warm up for rest of your journey. At the top of the stairs you will once again be on terra firma, where a nearly straight, smooth .7-mile path will lead you through the forest past dozens of downed trees and vines, across Oak Hill Road to the trailhead of Furnace Loop, a serene half-mile jaunt along moss-mottled ground. CVNP is open year-round, 24 hours a day, and does not charge a fee. Visitors may bring dogs as long as they accompany you on a six-foot leash. The Furnace Run Trail is impediment-free and spacious, so it provides an ideal place to take children on their first hike as long as everyone can make it up the 90 manmade stairs. And, it’s fun to look for the downed tree on the Furnace Run Trail that acts as a squirrel pedestrian bridge, and the shark-bitten tree and interesting green puffs of grass along Furnace Run. Remember to bring your bug spray: The deer flies are determined to taste your repellent-sprayed skin despite flailing arms and verbal threats. The rolling hills of the trail are fun to hike especially with the whistling of black-capped chickadees drowning out the sounds from the nearby road. Other small woodland creatures may decide to make an appearance, so don’t get too long in the birdsong to miss out on the squirrels, chipmunks, and rabbits around you. Because the parking area for Furnace Run Trail is shared by both Perkins and Riding Run, hikers who finish the Furnace Run loop and are looking for more can easily move on to these two loops. City residents will appreciate the quiet and solitude just a short half-hour drive from downtown. A quick trip here will make you feel miles away from the hustle and bustle of the city. Rocky Balboa wannabes and those preparing for Cleveland’s annual Tackle the Tower competition will love the climb.